A look at factors affecting international competitiveness. International competitiveness is a measure of the relative cost of goods / services from a country. Countries which can produce the same quality of goods at a lower cost are said to be more competitive. If the inflation rate is relatively lower than other countries, then over time you become more competitive because your goods will be increasing at a slower rate. For example, in the post war period Japan and Germany had relatively lower inflation rates than major competitors, this helped them to become more competitive. 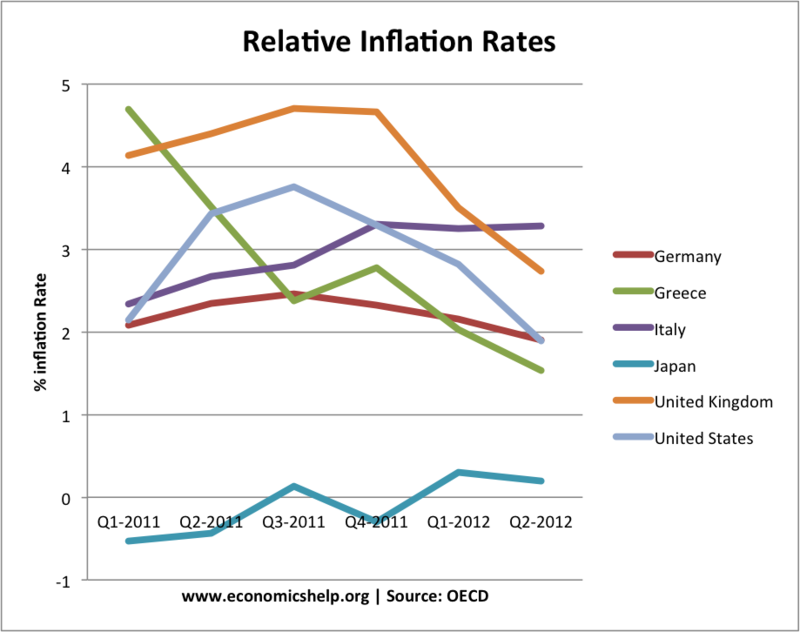 This graph of relative inflation rates showed that during the period shown, inflation in Greece fell from close to 5% to below 2%. 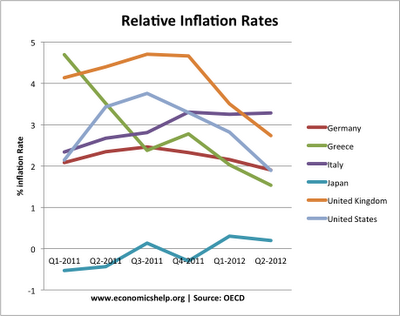 This suggests that Greece will have become slightly more competitive in this period. Productivity is a measure of output per input. The most common measure would be labour productivity. For example, with improved technology and education, a country can enjoy higher labour productivity and therefore produce goods at a lower cost. Higher labour productivity is the key to increasing competitiveness and living standards at the same time. 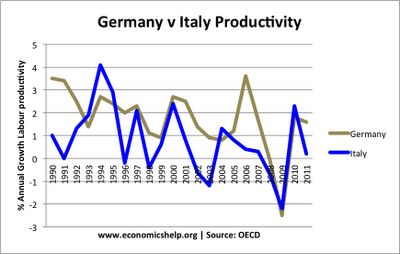 German vs Italian labour productivity. 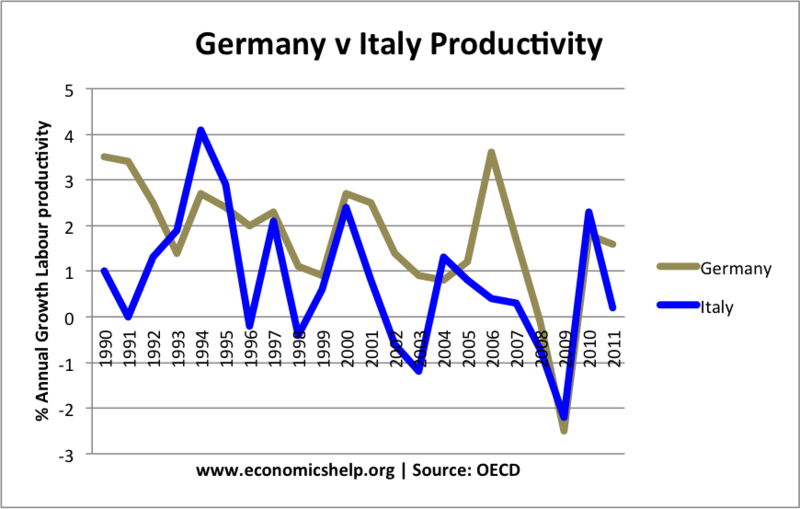 During this period, Italian labour productivity growth has tended to lag behind Germany, leading to lower competitiveness of Italian exports. 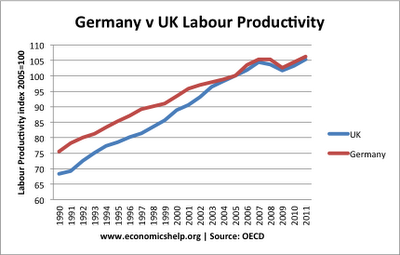 This shows labour productivity index for UK and Germany. 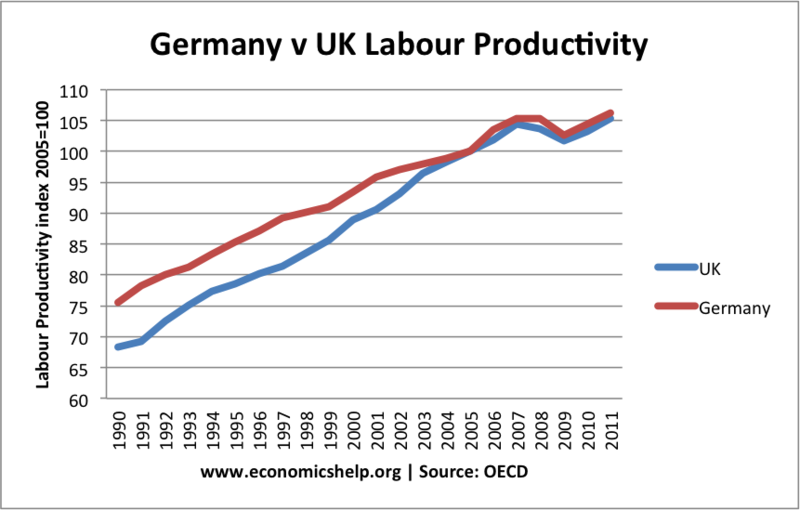 Between 1990 and 2005, Germany labour productivity increased 25 base points. UK labour productivity increased by 35 base points. Showing that the UK had faster improvements in labour productivity during this period. Movements in the exchange rate will determine competitiveness. For example, a sharp depreciation will make exports cheaper and more competitive. 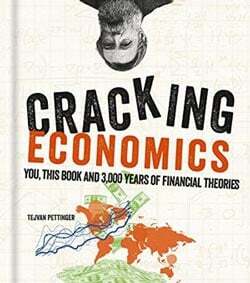 An increase (appreciation) in the exchange rate, makes the foreign currency price more expensive. Often movements in the exchange rate reflect relative costs. For example, if a country has lower inflation, this will lead to an appreciation in the exchange rate, making exports relatively more expensive. Thus a floating exchange rate, helps to maintain relative competitiveness levels. Government has used supply side policies to increase productivity. E.g. education and training. However, there is a limit to what the government can do to increase productivity. Increased productivity can be due to other factors. Tax rates on labour and corporations will be a factor in determining competitiveness. For example, higher labour taxes will increase the unit cost of labour faced by firms, leading to lower competitiveness. It is argued that countries with more labour market regulations and regulations about doing business will have higher costs and lower competitiveness. For example, the difficulty in gaining planning regulations to expand a factory. The World Bank produce a list of countries which are the 'easiest places to do business'. The criteria include factors such as flexibility of labour markets, degree of regulations, protection of private property. A key factor in determining competitiveness is the cost of transport. For example, some argue the UK's competitiveness is undermined by bottlenecks in transport, such as limited airport capacity in London and traffic jams on major roads.